Welcome to Caney Creek Haven! 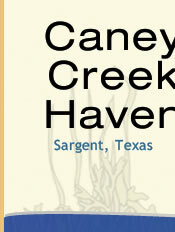 Caney Creek haven (CCH) is a deed restricted residential coastal community in Sargent, Texas located in Matagorda County. Approximately 20 miles from Bay City and Lake Jackson. Sargent offers shopping, restaurants, fishing, bait camps, RV parks and more. Conveniently located on Caney Creek, CCH provides easy boat access to the Intracoastal Waterway, East and West Matagorda Bay and the Gulf of Mexico. Fishing is outstanding in Sargent and Matagorda County. CCH provides a private boat ramp for the exclusive use of property owners. CCH also provides weekly mosquito fogging during the spring and summer months. A security camera is located at the entrance of the subdivision providing 24/7 monitoring. Maintenance of the boat ramp, mosquito fogging, operation of the security camera and the annual general meeting/election of officers and barbecue lunch are some of the expenses paid for by the Caney Creek Haven Civic Club Committee (CCHCC) throught he property owner's annual $175 maintenance fee. Please click on the "Documents" tab under the "Members" section of the home page to access the Deed Restriction, Amendments, By-Laws and other information about owning property in Caney Creek Haven.